RadioShack Nissan rider Frank Schleck has said that he will consider making a complaint of poisoning by persons unknown if his B sample confirms his positive ‘A’ test for the diuretic Xipamide. The Luxembourg competitor learned yesterday that he had failed a test taken on July 14th. It was a random control carried out soon after he rolled in 40th on stage 13 to Cap d’Agde, and was analysed at the lab of Chatenay-Malabry, near Paris. He released a statement yesterday evening denying all knowledge of how the substance got into his system. “A doctor at the UCI has just informed me tonight that banned substance was detected in my urine during a routine doping test carried out on 14 July 2012,” he stated. It is uncertain if the claim of poisoning would relate to a deliberate act of sabotage, or the contamination of a supplement. 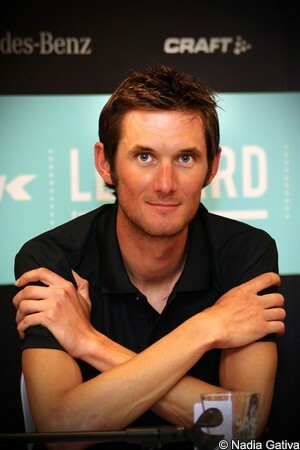 Schleck was sitting twelfth overall yesterday, nine minute and 45 seconds behind race leader Bradley Wiggins. He started the rest day with breakfast, then went for a two hour training ride alongside Maxime Monfort, with both riders being followed by RadioShack Nissan directeur sportif Alain Gallopin. After that, there was a team press conference in the early afternoon. The 32 year old Schleck then spent some time relaxing with his wife Martine, his daughter Leea and his mother Gaby. The mood was shattered with a phone call from the UCI around 7pm, telling him he had tested positive for the diuretic Xipamide. He made some calls, with Johan Bruyneel thought to have been one of those he spoke with, then he is understood to have eaten with his team. He left the hotel at 7.45 and went to the nearest police station in Pau. His team said afterwards that he went voluntarily, as he knew the police would come looking for him otherwise. He voluntarily withdrew from the race, although the UCI made it clear it its statement announcing the news that it expected him to do so. “Under the rules of the UCI (International Cycling Union), Frank Schleck could have been at the start on Wednesday morning. But deciding with his team, the rider has retired,” he said. According to directeur sportif Alain Gallopin, Schleck must get on with his course of action, while the team must continue with its Tour. Andy Schleck: “The Tour next year is for me."